As experienced builders, we can construct anything from practical home extensions to complete new house builds. We also carry out renovation work including kitchen fitting, bathroom fitting and loft conversions. Our team works closely with clients in Dorking, Reigate and the wider local area to design and deliver results on time and inside budget. 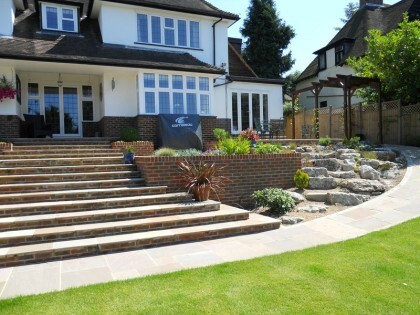 Our landscaping services have seen our company win awards, such is the quality and originality of the work we do. New lawns, patios, borders, driveways, water features and brick-built BBQ’s are just part of the story. Speak to us today to see what Precise Construction can do for your Reigate, Dorking or Surrey property.